COLERAIN TOWNSHIP, Ohio, March 19, 2014 (ENS) – Hazmat crews are cleaning up about 10,000 gallons of crude oil that spilled from a broken underground pipeline into an Ohio nature reserve Monday night. The oily mess has affected close to one mile of a creek running through the Oak Glen Nature Preserve. Crews are vacuuming up the oil that covers the surface of a pond, but Steven Renninger of the US EPA says it could take more than a week before cleanup at the Hamilton County park is complete. Renninger says the oil is being vacuumed up by truck-mounted equipment and placed in holding tanks for later disposal. After the pond is cleaned, crews will remove oil on the creek bed. The damaged pipe is part of the Sunoco Logistics crude oil interstate pipeline operated by Mid-Valley Pipeline Co. Both companies are subsidiaries of Sunoco, an American oil company based in Pennsylvania. The 1,100 mile pipeline starts in Longview, Texas and ends in Samaria, Michigan, about 12 miles north of Toledo, Ohio. The Colerain Fire Department responded to reports of a oil smell at about 8 pm Monday. They found “petroleum product” in the Oak Glen Nature Preserve near Blue Rock Road. 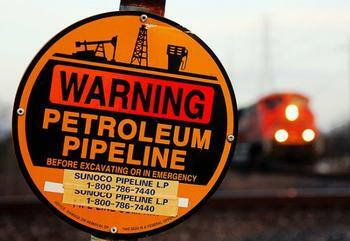 It took more than five hours before a Mid-Valley Pipeline crew was able to shut down the line. By early Tuesday morning crews had contained the leak and began repair work on the 20-inch pipeline. The pipe was laid in the mid-1950s, before the land was identified as one of four conservation areas owned and operated by Great Parks of Hamilton County. The Ohio Department of Transportation began investigating today but officials have yet to pinpoint the cause of the pipeline break. The cause the leak is under investigation by the U.S. Environmental Protection Agency and the Ohio Environmental Protection Agency. It is the 40th leakage or spillage incident since 2006 along this pipeline, according to the U.S. Department of Transportation’s Pipeline and Hazardous Materials Safety Administration. “As drilling increases in Ohio, so too will the burden on infrastructure to transport these products to market, often overseas. With the increase in pipelines cutting through our preserves and farmland, comes a greater risk of future spills and leaks. “Our thoughts are with those impacted by Monday’s leak, and it is our hope that damage to drinking water can be avoided,” Auciello said. The Great Miami River, about a quarter of a mile away, appears to have been spared, although tests are not yet complete, says a spokesperson for the Ohio Environmental Protection Agency.